The Muslim Geeks – A blog for techy muslims » An iPhone app for every occasion! Eid Mubarak! Sorry but we’re busy celebrating this sacred day! ; -) So this will be a quick one for iPhone users! 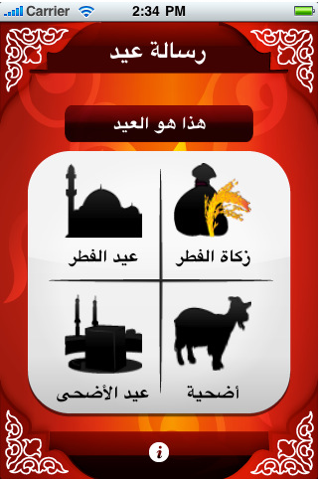 You know the iPhone/iPad App store is tremendously rich of pretty much everything and…Yes, there is a very useful Eid app as well that we wanted to share with our muslim brothers and sisters. We actually like this app, because it’s in both English andArabic and addresses the sunnah about eid and all surrounding information, zakat al fitr, salat al eid and much much more. Here is the link, you can access muslimgeeks.com from your iPhone and click the link. That will lead you to the direct app store entry. And by the way, keep this app at hand because it has not only Eid al Fitr info but also Eid al Adha that is not that far away.